Today is Secret Recipe Club’s November reveal date and the one that I was almost going to miss if I had not had that nagging feeling… you know, the feeling that you know there is something you have to do, but can not remember what it was for days. Then laying awake in your bed at 2 am on Saturday night, all of a sudden you go “Aaaaah… now I remember!”. SRC was founded by Amanda from Amanda’s Cooking. It is a great way to introduce us to new bloggers by trying their recipes and helps our blogs to be introduced to the others as well. We do all the cooking in secret, not letting anyone know whose recipe we are trying that month. I was assigned to Lisa’s blog Parsley, Sage, Desserts and Line Drives. If you are wondering where the “line drives” part is coming from, she is a big NY Yankees fan. She says she is a laid back chick but I am not sure if I believe that after seeing the intensity and amount of great recipes. She must be cooking and baking like crazy! I loved going through the recipes and I marked her several recipes three weeks ago when we were assigned. But since I was not organized and remembered the reveal date at the last minute, I did not want to mess up her cannolies since I have never made them before. And how about these eyes! Definitely making them next Halloween! So I chose her Bakewell Tart. Sounded like it was something I could handle on a lazy Sunday and had everything in the fridge and pantry already.We loved it. It was not a heavy, buttery tart at all. The only difference I made was to skip spreading jam under the almond batter. I put whole raspberries on top which looked like holes in the baked tart once the batter puffed up and wrapped around it. The sour note on the raspberry balanced the sweet tart.Please visit her blog for the recipe and enjoy her British accented writing in this post. We love having tea and dessert late afternoon, especially on a cold Sunday. My favorite spot at home is this comfy chair by the window where I would like to sit and read a book, go through the magazines, or just chat with Jay while I am all bundled up in my blanket with a glass of tea in my hand and with a slice of my latest post on a plate. That blanket is my security blanket. My grandmother, Emine, knitted it for me before I came to the US eleven years ago. This blanket has been with me since then, went through many apartments, packed in many boxed, and absorbed many tears. I have not tasted your cooking but your photography skills are improving everyday! Excellent job with the composition and lighting! Thanks Marian, please feel free to critique and give me tips! I always need both! What a beautiful tart! Pretty impressive considering it was last minute! 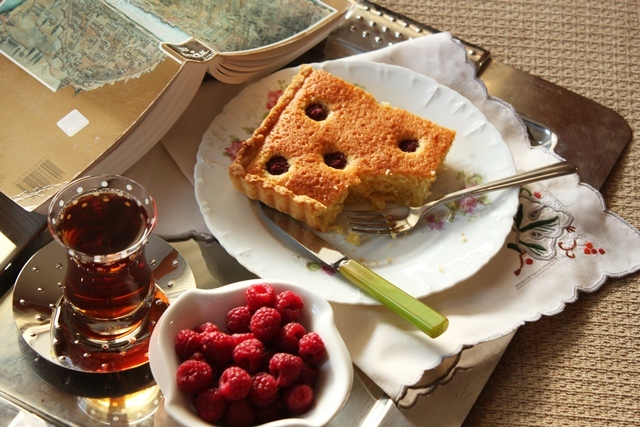 I had never heard of Bakewell tart – sounds so yummy! And your pictures are beautiful; I love the composition and styling. 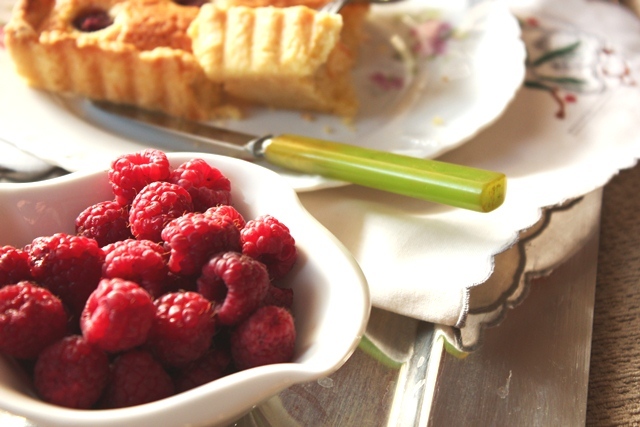 I love bakewell tarts…how nice that you can still find fresh raspberries. The cake looks stunning. I grew up eating bakewell tarts as a kid and now I miss them very much, great with a cup of tea! I skipped this months SRC, just way too busy but you done a great job and I’m glad I found your blog! I’ve been meaning to make a Bakewell for a while now… may just have to break my rules about out-of-season berries to try out your variation. Your pictures are simply stunning. It’s like looking at a magazine. 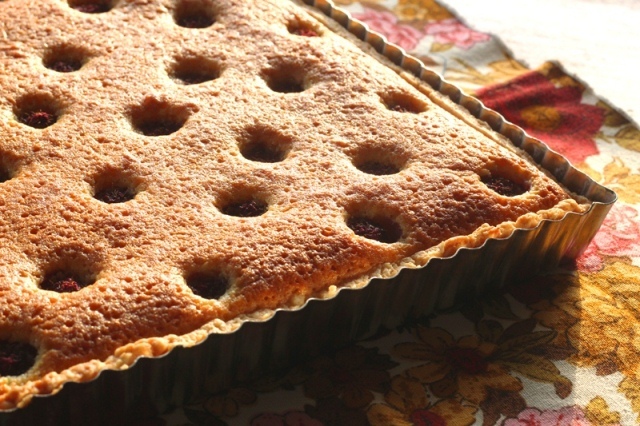 Lisa has a wonderful blog and your variation of her bakewell tart looks fabulous. Great SRC choice. I love bakewell tarts! I made one a few years ago and haven’t made one since. I need to make one again…thanks for the reminder! Oh Lisa’s blog is the best isn’t it. She is hilarious. And what a beautiful choice you made with this tart, looks fantastic. 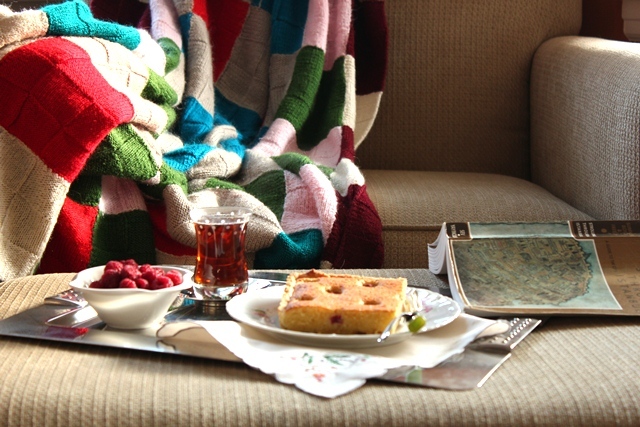 The tart looks like a lovely addition to your tea, chair and cozy blanket. Such a nice story. Looks yummy! And your photos are looking fantastic! You’ll have to give me some pointers on shooting food! Had fun with you Saturday night! That looks delicious! Now I’m interested in trying one of those tarts myself. absolutely love your pictures and the cake looks pretty tempting too! Looks gorgeous and warm and would love to have it with a cup of tea!!!! Yum… I sure wish I had a slice of this fabulous tart right now with my afternoon coffee! You know this is my kind of food! What a great SRC pick! And I love the story of the blanket. So sweet. What beautiful photos! It looks amazing!